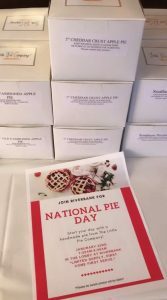 In celebration of National Pie Day, we set up a table in the lobby for residents to grab their very own mini pie on their way to work in the morning! At a first come, first serve basis, the pies from the nearby Little Pie Company were extremely popular! With flavors ranging from the classics such as old fashioned apple, triple berry, key lime and Mississippi mud, to fun flavors like sour cream apple, cheddar apple, and banana coconut, there was definitely something for everyone.